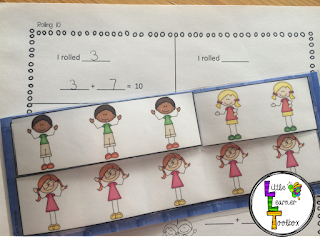 This 'Making 10 with Friends' activity is a fun and hands-on way for your students to engage with the Ten Frame and 'Make 10' by counting on. This game comes with a set of 'friends' number strips, a ten frame and recording sheets. Students roll the dice and record the number that they roll. They fill in that number on the ten frame, using cute 'friend' number strips. They then count on to ten, to figure out 'how many more' they need to make ten. They fill in the ten frame using the number strips and then write their number sentence on the recording sheet. This would make a fun math center for your classroom and gives some hands-on ten frame fun!